Windstream reported mixed Q4 results, but the stock rallied as cash flows continue to cover the large dividend. The telecom provider made several capital return moves suggestive of an oversold stock. Ultimately, the stock offers a limited margin of safety with the current balance sheet. In my last article, I highlighted how Windstream Holdings (NASDAQ:WIN) offered a large dividend backed up by solid free cash flow. The biggest concern with buying the stock was whether the market could handle the mounting losses reported by the telecom provider. Read the full article on Seeking Alpha. Baidu soared on solid Q4 results and guidance for Q1. The Chinese Internet search giant will benefit from multiple efforts to remove costs from the financials. The recommendation is to own Baidu as operating margins rebound going forward. Despite obvious value, Baidu (NASDAQ:BIDU) traded near its lows over the last few months. The fears over the Chinese economy have overshadowed the company's incredible growth rates and the shift in the economy towards services and domestic consumption that benefits Internet-based businesses. Read the full article on Seeking Alpha. Disclosure: Long BIDU. Please read the disclaimer page for more details. More questions swirl about the ETE and Williams deal. A termination fee paid to Williams would quickly shore up dividend coverage and funding requirements of the next year or more. Based on the news, Williams is a stock to avoid unless more details emerge suggesting a termination fee is actually forthcoming that would provide an opportunity for the company. Despite a market rally on Thursday, Williams Cos. (NYSE:WMB) traded down over 3% on a couple of headlines that reinforce the risk surrounding the stock. My previous questionsregarding the risk in the stock are only magnified now. Read the full article on Seeking Alpha. Sprouts Farmers Market crushed Q4 estimates while the stock ironically traded towards the post-IPO lows. The company benefits from a focus on affordable produce and reasonable margins to drive traffic growth. The stock is recommended long-term holding, but investors shouldn't chase the stock higher at the current levels. Over the last six months, I encouraged investors on multiple occasions to not view Sprouts Farmers Market (NASDAQ:SFM) so negatively (here and here). Outside of the flash crash, the stock traded down to $20 on two occasions providing attractive entry points. Read the full article on Seeking Alpha. Lowe's generated substantial comp sales growth during Q4 due to warm weather over the holidays. The purchase of RONA, subsequent exit of an Australian business, and reduced stock buybacks are all warning signs. The recommendation remains to avoid the richly priced home improvement retailer benefiting abnormally strong comp sales growth. Despite generally positive Q4 earnings, Lowe's (NYSE:LOW) traded mostly tepid for the next couple of days. Even with the ongoing positive results, the stock is struggling per my prior warning. Read the full article on Seeking Alpha. Glu Mobile has a big plan for celebrity games. The original revenue targets appear farfetched, but the social followers and mega stars might provide more staying power than market expectations. The stock remains amazingly cheap, considering another hit celebrity game and plenty of catalysts throughout this year. With the initial success of another celebrity game, Glu Mobile (NASDAQ:GLUU) investors can finally start viewing the possibility of a long revenue stream from celebrities. Going over 18 months without a successful celebrity-based game launch since the original Kim Kardashian: Hollywood made it impossible for the market to embrace Glu's vision. The stock paid the price, trading below $2 recently. Read the full article on Seeking Alpha. Disclosure: Long GLUU. Please read the disclaimer page for more details. Macy's easily surpassed reduced Q4 results due to a snapback in sales from cold weather in January. Even after the recent rally, the stock trades far below the intrinsic value of the real estate assets and a profitable retail operation. With several catalysts in 2016 and beyond such as the new store concepts and capital returns, the stock is a core position in a value portfolio. The final Q4 results for Macy's (NYSE:M) indicates that weather truly impacted the apparel business over the holidays. The limited cold weather in the prime Northeast stores prior to the holidays was highly harmful to results. Read the full article on Seeing Alpha. Disclosure: Long M. Please read the disclaimer page for more details. Motorola Solutions easily smashed EPS estimate for Q4. The tech company returned $3.5 billion to shareholders last year due to large stock buybacks including a Dutch auction. With the ramping EPS estimates, the stock is a recommended buy. After a post-earnings rally, Motorola Solutions (NYSE:MSI) is one of the few tech stocks trading near multi-year highs. The stock benefits from large stock buybacks the market typically discounts. Read the full article onSeeking Alpha. Fitbit easily smashed Q4 estimates due to a strong holiday season. The weak Q1 guidance is a mixed blessing by adding to worries over the fad nature of the business and providing a lower entry point. The valuation in the stock is finally compelling with the market no longer having any expectations from the company. Despite the strong holiday sales, Fitbit (NYSE:FIT) trades near post-IPO lows due to the self-inflicted wounds and market fears highlighted in my previous research. Unfortunately, for investors, the company has a long way to go to prove that the fitness tracking business isn't a fad and Under Armour (NYSE:UA) isn't a competitive problem. Read the full article Seeking Alpha. Weak Q4 cash flows don't help the dividend coverage ratio and concerns about the ability of Williams supporting the dividend. The questions surrounding the business relationship with Chesapeake Energy was extensively discussed in the presentation and earnings call, yet the impact from a restructuring remains unknown. Too many questions remain regarding negative outcomes to owning Williams. Williams Companies' (NYSE:WMB) quarterly results brought some interesting points regarding Energy Transfer Equity (NYSE:ETE) and Chesapeake Energy (NYSE:CHK). The details didn't really provide a resolution to the outstanding issues highlighted in my last article. Read the full article on Seeking Alpha. Nvidia smashed FQ4 earnings on robust revenue growth. The market seems to understand the growth drivers, but the earnings story is misunderstood. The stock is a strong recommendation on any pullback going forward. After warning investors that upside was limited prior to the drop leading to a bottom in mid-February, Nvidia (NASDAQ:NVDA) is only now trading back at those levels after the rally following solid FQ4 earnings. My previous thesis centered on a stock that had doubled in a little over a year despite limited revenue growth. Read the full article on Seeking Alpha. The top 10 net payout yields had a larger loss than the benchmark index in January. . The top 10 net payout yield stocks average yields of 20.8% to start February. . Motorola Solutions continues to hold the highest yields at 38.6%. . This article is a continuation of a monthly series, highlighting the top net payout yield (NPY) stocks, that was started back in June 2012 (see article) and explained in August 2012 (see article). The series highlights the best stocks for the upcoming month utilized in part to make investment decisions for the Covestor model that is now beating the S&P 500 for five out of the last six years. Please review the original articles for more information on the NPY concept. Read the full article on Seeking Alpha. Disclosure: Long AAL, AIG, BBY, CBS, CTL, GM, KSS, M, MSI, NTAP, QCOM. Please read the disclaimer page for more details. The new celebrity game is a big hit even prior to the official release.The Kendall & Kylie game brings an additional game into the celebrity theme to test the ability to incrementally grow the concept.Based on initial success, Glu Mobile is on pace to smash Q1 guidance. After the failed release of the Katy Perry Pop game, Glu Mobile (NASDAQ:GLUU) sank an incredible amount. The stock fell all the way to a low of $1.98 with the recent market selloff, but my recommendation remained firm that large opportunities existed for a big rebound. NetApp continues to rebound as investors absorb the initial disappointment with guidance. The dilutive impact of the SolidFire deal sets the company up for growth in FY18. The stock trades at an incredible value after the Q4 plunge. Similar to a lot of large technology companies, NetApp (NASDAQ:NTAP) remains in a constant transformation loop. The company builds new storage products that struggle to maintain overall revenue levels as legacy products lose steam. The transformation though continues to leave the stock trading at multi-year lows while the company produces strong free cash flows. Despite weak guidance, the stock is actually bouncing higher on hopes for stability going forward and the possibility of a boost from the purchase of fast growing SolidFire. Read the full article on Seeking Alpha. Freeport-McMoRan monetizes part of the Morenci mine at an attractive valuation to reduce the debt crunch. Even after the recent rally, the stock is down substantially over the last two years. With plenty of other copper assets, the debt fears should quickly fade as the S&P downgrade likely signaled the panic lows for those fears. 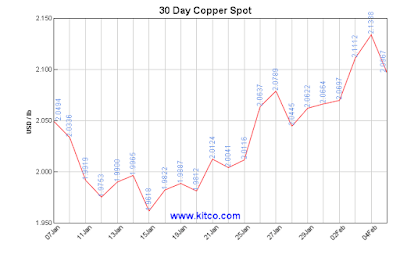 The news that Freeport-McMoRan (NYSE:FCX) reached an agreement to monetize part of a copper mine was a game changer for the stock. Though the company took copper and gold out of the official company name, investors made a big mistake taking a focus away from those two commodities. The stock is now surging towards $7.50 following a massive rally. At this point, one has to wonder if the rally doesn't need a pause, but investors need to remember where the stock came from in the last couple of years. Read the full article on Seeking Alpha. T-Mobile reported a big Q4 earnings beat. The stock saw limited traction due to the valuation and questions regarding valuation. My recommendation remains neutral on the stock, with the only reason to own it for a short-term momentum play. T-Mobile's (NASDAQ:TMUS) quarterly results again provided some industry leading numbers around user and service revenue growth. The aggressive domestic mobile provider even smashed earnings estimates, though the stock got limited traction. Read the full article on Seeking Alpha. FireEye provided 2016 guidance that includes ongoing reductions in organic growth and still elevated operating costs. The cybersecurity specialist is busy buying smaller firms to boost growth. The stock is difficult to own for the long-term based on fundamentals, but offers a short-term trade option. When a stock declines after reporting earnings while the market surges, one knows the results were a big disappointment. In the case of FireEye (NASDAQ:FEYE), the cybersecurity specialist reported mixed Q4 results and 2016 guidance. Read the full article on Seeking Alpha. Epic Stores offers a growth opportunity in a sector that benefits from a weak economy. The resale sector has recently outgrown the general retail sector even during economic expansion. The stock is highly risky due to the need to secure additional growth capital and ongoing quarterly losses. The company needs to prove it can profitably scale operations before aggressively investing in the concept due to capital needs. As the stock market falls and investors debate whether the global economy is headed towards a recession, the dollar and thrift stores offer an intriguing recession play. If the economy does slow down, these type of stores should benefit from consumers with tight budgets looking for quality products at a discount. Read the full article on Seeking Alpha. CenturyLink smashed Q4 estimates and increased guidance for 2016. Despite a big rally, the stock still offers a higher dividend yield than the large domestic wireless providers. The recommendation is to continue owning CenturyLink until the yield falls into the range of the telecom giants. The market rejoiced the that CenturyLink (NYSE:CTL) reported a blowout EPS number for Q4. The telecommunications provider had seen the stock collapse with the market despite a large dividend that was supported by cash flows. Read the full article on Seeking Alpha. LendingClub reported solid Q4 earnings and guided up for 2016. Fears over the impact to the online lending marketplace in the next recession appear misplaced. The stock is cheap, but likely gets cheaper. The interesting news of the week is that a beaten down online lending marketplace plans a $150 million share buyback. Due to a large level of pessimism, LendingClub (NYSE:LC) falls into my general theme of stocks beaten down to extreme lows despite obvious growth potential. Read the full article on Seeking Alpha. Williams trades near lows as a key executive departs ETE. Negative news swirls around a key customer in Chesapeake Energy that questions the stable cash flows from the pipeline business. The recommendation remains to avoid the stock with the business model under pressure and no guarantees on the cash portion of the ETE deal. After another tumultuous week, Williams Companies' (NYSE:WMB) shareholders find the stock trading close to new multi-year lows. My previous warning was that a restructuring of the cash portion of the Energy Transfer Equity (NYSE:ETE) deal was needed despite the statements from the Board of Directors. Read the full article on Seeking Alpha. Zynga plunges prior to the release of Q4 earnings.The stock trades at valuations reminiscent of Glu Mobile prior to the recent post-earnings rally.At this valuation, Zynga doesn't need any catalysts for a rally; however, a couple of new games provide the opportunity for a big hit at last. The market is spooked by some of the large selloffs after stocks report weak Q4 numbers or provide tepid forward guidance. The key though is to understand where the stock comes from heading into the earnings release. Occidental continues to hold up well due to a strong balance sheet.The company still needs to work on improving cash flows to ensure the dividend can survive the current oil price slump.The stock has more downside risk with cash flows in the current negative position. With the cutting of the dividend by ConocoPhillips (NYSE:COP), all of the major oil companies are under extra scrutiny now. Dividends that were previously unquestioned will now need cash flows to justify paying them going forward. Along with the Q4 release was news that Glu Mobile (GLUU) purchased game developer Plain Vanilla Corp. The company paid $7.5 million in a convertible note for a minority stake in the maker of the game QuizUp. The deal apparently gives Glu the opportunity to purchase the company in the next 15 months at a pre-agreed price. The deal involves Glu Mobile helping Plain Vanilla develop a QuizUp television program for NBC Universal. Also, Glu is going to help Plain Vanilla monetize the mobile game that isn't being done currently. Based on the revenue generated by fellow trivia game Trivia Crack, QuizUp has tons of potential for generating sizable revenues. Currently, Trivia Crack makes roughly $50,000 on a daily basis with the iPhone in the U.S. Of course, Trivia Crack has slightly higher download rankings so these numbers might not be achievable. Though oil continues plunging, the oil giants continue producing more. 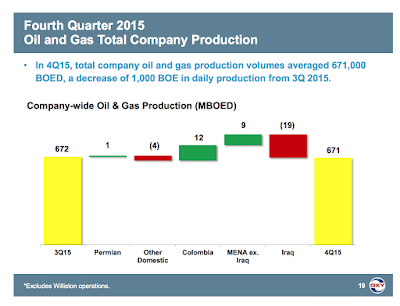 For Q4, Occidental Petroleum (OXY) had roughly flat production. The worst part is that OXY plans to grow production by 2% to 4% in 2016. The stock has held up somewhat strong, but the inability to turn off the spigot remains troubling. Tableau Software beaten down on weak guidance.The biggest problem with the stock was a high valuation that didn't price in the expected revenue slowdown.The valuation represents a bargain for the business analytics sector. Glu Mobile easily surpassed Q4 estimates despite the Katy Perry game flopping.Sustaining games and new investments provide a huge opportunity going forward.The valuation of the stock is already pricing in further game failures not supported by beta tests.